Welcome to Royal Printing123.com; before accessing this web-site or place an order with Royal Printing, you must know and agree the terms & conditions bellow. Please read carefully, if you do not agree our terms & conditions, please do not access this web-site or place an order with Royal Printing. We reserve the right to change, modify or alter these terms and conditions without any notice. By accessing or using Royalprinting123.com, you agree to be bound by all of the Terms and Conditions be posted in connection with specific sections or services of this Website. The content of the pages of this website is for your general information and use only. It is subject to change without notice. Neither we nor any third parties provide any warranty or guarantee as to the accuracy, timeliness, performance, completeness or suitability of the information and materials found or offered on this website for any particular purpose. You acknowledge that such information and materials may contain inaccuracies or errors and we expressly exclude liability for any such inaccuracies or errors to the fullest extent permitted by law. Your use of any information or materials on this website or any other liked website is entirely at your own risk, for which we shall not be liable. Again, you understand that all information, data, text, photographs, graphics, messages or other materials ("Content") are the sole responsibility of the person from which such Content originated. This means that you, and not Royal Printing, are entirely responsible for all Content that you use from us. You agree to bear by these terms of service and not to use these products and services or related messages for any unsolicited or unauthorized advertising, promotional materials, "junk mail, spam, chain letters, pyramid schemes, or any other form of solicitation”. It shall be your own responsibility to ensure that any products, services or information available through this website meet your specific requirement. All trademarks reproduced in this website which are not the property of, or licensed to, the operator are acknowledged on the website. Unauthorized use of this website may give rise to a claim for damages and/or be a criminal offence. From time to time this website may also include links to other websites. These links are provided for your convenience to provide further information. They do not signify that we endorse the website(s). We have no responsibility for the content of the linked website(s). You may not create a link to this website from another website or document without Royal Printing's prior written consent. Your use of this website and any dispute arising out of such use of the website is subject to the laws of the United States of America and the State of Michigan. You further acknowledge and agree that Royal Printing may preserve Content and may also disclose Content if required to do so by law. We will process your order, however Royal Printing will not be held liable for any and everything that happens in regards to fraudulent use of products purchased. Royal Printing 24/7 Services stands behind the quality of its products and services with 100% guaranteed. Customer is fully responsible for final proof and layout approval prior to the printing process, your responsibility is to ask final proof and layout. Please note that we cannot be responsible for: Misspellings, Graphics, Bleeds, Grammar, Damaged Fonts, Punctuation, Wrong Cuts, Incorrect or Missing Folds, Finished Product Size, low-resolution, design errors, color selection errors introduced by the customer in the artwork file creations. More over incorrect shipping address, undeliverable packages/3 rd delivery attempts, or other errors created by the customer. Please be advised that we do not accept checks from first time customers. 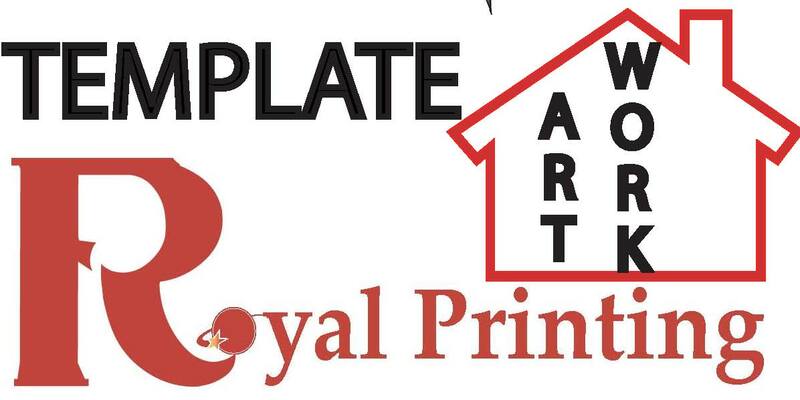 If you have any questions, please email us at john@royalprinting123.com or contact our Accounting Department. Important: Your order will not be processed until payment is received. If a User submits a request for to purchase printing products, mailing services, design services or other services, the User agrees that all charges, Michigan Sale taxes and shipping and processing fees will automatically be charged to the credit card or paid by User with an approved payment method. Once a print job has been approved by customer and sent to press department. After a print job has been sent to the prepress, the customer is responsible for any balance due unless otherwise noted. In some cases, a refund may be extended to the customer if no work has been done by Royal Printing on that print job. Once the order is placed, if our credit team has any questions they will contact you within 24 hours, otherwise your order will be processed. If you are representing for a Non-Profit Organizations or Reseller, you are eligible for the tax exemption. We need paperwork for the tax exemption, an authorization letter copy issued by the IRS under section 501(c)(3) or 501(c)(4) together with the filled up application form _3372" issued by Michigan Department of Treasury. Up on your request, we will provide the form 3372. Royal Printing neither makes any explicit warranty nor imply or accepts any responsibility other than possible replacement of the products that Buyer is buying, we may but does not guarantee the replacement of the defective product, or credit the amount of the purchase price. Royal Printing shall not be liable to anyone for any kind of financial losses, cost, expenses, damages and/or other economic damages. We are not responsible for any expense and damages including legal costs on account of any and all manner of claims, demands, actions, and proceedings that may be instituted against Royal Printing and its affiliated company (S) on grounds alleging that the said work violates any copyrights, trademarks, service marks, or is scandalous, or invades any person's right to privacy or other personal rights. Royalprinting123.com, will be happy to help you to cancel your order prior to printing. Our Customer Service Team will inform you of any cancellation charges depending on the stage of the order. However orders may not be cancelled or refunded once they have been Plated or any process thereafter. Absolutely no refunds will be issued once an order has been plated or any process thereafter, including but not limited to Printing, Coating, and / or Finishing. Once the order has been placed successfully, no refunds are issued. Royalprinting123.com is not responsible for any duplicated orders that are placed on our web site due to the customer mistake. Royal Printing is based in Macomb, MI and any legal action or proceeding relating to or arising from your access to or use of this Site or any transaction with us, shall be instituted in Utica. MI. You agree to submit to the jurisdiction of the city of Utica, the county of Macomb, the state of Michigan and the United States of America, their courts and agree that venue in these courts is proper in any such legal action or proceeding. You agree to indemnify and defend Royalprinting123.com or any link harmless, its partners, affiliates, subsidiaries and suppliers from any liability, loss, claim and expense related to your violation of this Terms and Conditions. You agree to defend, indemnify, and hold Roylprinting123.com harmless from any and all claims arising from or relating to any text, photograph, and image, graphic or other material you incorporated into Products. Please note color proofs cannot match the final product 100% due to the fact that proofs are created in a different way than the printed piece and the customer supplied proofs are not calibrated to our presses. We recommend you convert all images to CMYK . Royal Printing will reproduce color from submitted print-ready files as closely as possible, but cannot exactly match color and density because of limitations in the printing process, as well as neighboring image ink requirements. Although the accuracy of each color reproduction is guaranteed. Again Royal Printing cannot guarantee color reproduction for your print-ready files. Please note that we accept no responsibility for color variations between submitted print-ready images and the actual artwork or product they represent. We are unable to Sell or Supply the Digital Images / Art Works or Computer Copies Created, Edited, Modified or Altered. All the charges you paid with Royal Printing are final for the current transactions only, it includes the Setup Charges. We know that short deadlines are a given in the print industry. That's why most of the jobs are set it up at Royal Printing are by default Same Day or Next Day Turnaround. If your job or proof is approved by 5:00 p.m. ET, printing turnaround time begins that business day. In addition, printing turnaround time does not include shipping transit time, and you should allow additional business days for delivery based on the shipping method you selected. If the production department will receive your print ready order files by 5:00 p.m. ET, your order will ship / available for Store Pick-up between 8:30 a.m. - 8:30 p.m. ET (7 Days a Week). We also offer Same Day services, order by 12 p.m. ET and your order will ship that business day or available for Store Pick-up between 8:30 a.m. - 8:30 p.m. ET (7 Days a Week). Our “7days a week services” we provide Door to Door Direct Delivery / Event Location Spot Delivery (only in Metro Detroit Local Areas). Please check with us for the Weekends and Holiday Printing. From our 24/7 Services - you can place Order, request Quote or for Setup an Artwork. Our prepress department checks most artwork files before printing, but you are still 100% responsible for the accuracy of your print-ready artwork files, and we encourage you to proofread all files carefully before submitting to us. Color space is one of the most often misunderstood terms. Simply put, the offset printing process prints color in the CMYK range. (Spot color is another entire issue, which is not applicable here). To enable jobs to fit into our automatic workflow, Royal Printing currently recommending files in: EPS, TIFF or PDF. For the customer satisfaction we accept all file format like JPG, TIFF, PUB, PPT, DOCX and much more please contact us for the specific guidelines for the file type. Should be 300 dpi; Set all fonts to outlines (curves), images are flattened (no layers) and file saved in CMYK. Do NOT use LZW compression. Be certain that any placed images are converted from RGB or spot color to CMYK. 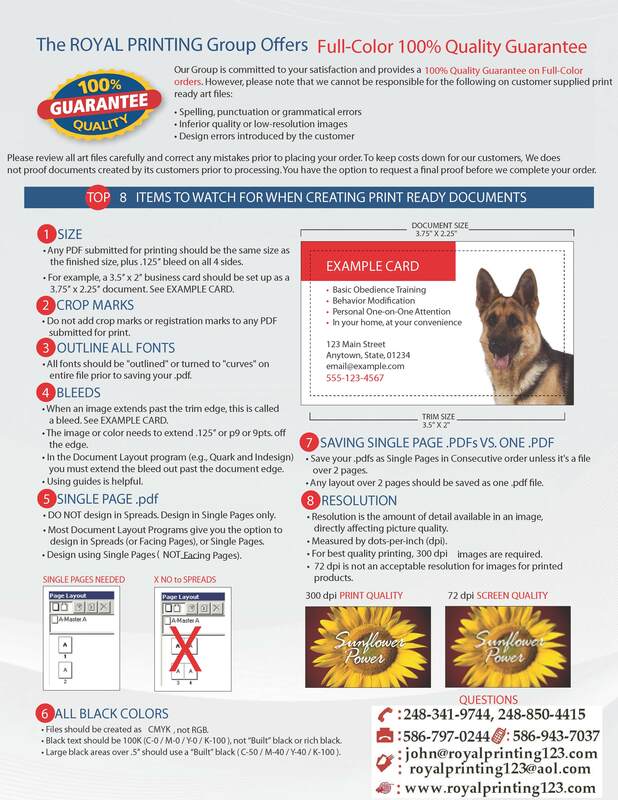 Be sure your source file is created properly, with the document size being the finished trim size PLUS .25inch or .125inch extra bleed space for the die / Trim cutting. For example 8.50” x 11” finished product size would have a bleed size of 8.75” x 11.25” or 8.625” X 11.125”, we are not recommending more than or less than the extra bleed space. Do not add crop marks, registration marks or color bars. Many software programs will export files as Portable Document Format (PDF). We do NOT recommend this option unless you are confident that your conversion settings are correct. Otherwise we suggest you export or save your file as an EPS or TIFF. Be sure your source file is created properly, with the document size being the finished trim size PLUS .25inch or .125inch extra bleed space for the die / Trim cutting. The optimum resolution 300 dpi or keep it as minimum. Even if your job contains black and white images, they should be saved as grey scale at 300 dpi. All images should be included at 100% scale (of the print size) and must be submitted in uncompressed TIFF format without layers (flattened). They must all be converted to CMYK colors. Remember, a higher quality image resolution does not always result in better print quality. Excessive image resolutions (beyond 300 dpi) will only dramatically increase your file size and in most cases will not improve the print quality. Furthermore, it may require extra time to upload larger files. We do not accept files which require fonts to be available on our printing servers. All fonts used must either be turned to outlines, flattened or embedded and ensure that your fonts and graphic files are resampled correctly. For the Artwork / Digital work is done through by Royalprinting and require any special fonts, we will inform to the customer. Be sure your source file is created properly, with the document size being the finished trim size PLUS .25inch or .125inch extra bleed space for the die / Trim cutting. RGB colors are used by most digital cameras and must be converted to CMYK colors. The color printing process only uses CMYK, and RGB colors converted automatically in our RIP may have unexpected results. Camera Pictures (RGB )are good for Signs and Banners printing, no need for any kind of conversion. Royal Printing will not be responsible for undesirable colors stemming from residual RGB images. Images found on the Internet are typically at a resolution of 72 dpi in addition to being RGB. This resolution is much too low for quality printing and will produce very poor results. You are also taking a risk by using images without permission that may be copyrighted. Computer monitors display their colors in the RGB range. When RGB is converted to CMYK, which is the standard by which all offset process color printing is currently done, some RGB colors will be out of gamut: lost in the conversion process. Royal Printer’s digital workflow will automatically convert any RGB images to CMYK, but the results may not be what is expected. We recommend you convert all images to CMYK (at the standard SWOP setting) prior to sending. This also includes any placed bitmap images. That way you will have a better idea of how they will actually print. Please note that we accept no responsibility for color variations between submitted print-ready images and the actual artwork or product they represent. No Refunds or Credit! all the charges related to expediting printing (rush printing or shipping) are non refundable, including those orders that are returned for any reason. Each order is unique; it has no re-sale value, therefore All Sales are final. If we verify that we made an error on our end -“Printing”, we will reprint. For the reprinting; customer must notify to the Royal Printing within 5 business days. It doesn’t mean to cover up the Digital work / Art Work quality issues (300 dpi less than the image you saved for color printing or black and white printing). If your images should not be included at 100% scale (of the print size) and not presented an uncompressed TIFF without layers (flatten), you are not qualify. If your digital is not converted in to CMYK colors, you are not qualifying for reprinting.Before reprinting; our prepress department will check the defective item you returned. Buyers are the responsible person for the return shipping and handling charges. In order to receive replacement or reprint; Customer must return 100% of the received product within 15 days (on their own expense) from the time when the ordered product delivery was taken. A photograph of the problem may be required for documentation purposes and/or for proper assessment of the problem. If your package arrives damaged, we suggest reporting the damage to the shipping company. Make sure to take photos of the damage to the package as well as the damage to the product. We cannot guarantee any warranty on damage after the product has been installed. Royalprinting will make several attempts to contact Customer when packages are ready for pickup. Customer has up to 15 days to pick up the package(s) from our facilities during pickup hours (Store Pick-up between 8:30 a.m. - 8:30 p.m. ET (7 Days a Week) call and get appointment for late pickup. If Customer does not pick up the package(s) within this time period, the package(s) will be discarded, and Royalprinting will not be held liable for the discarded item(s).Please be advised that courier pickups are not permitted, and customers must pick up their own orders. We Offer "0-10lb" FREE Overnight Shipping, it will cover up almost all States in USA. We provide Over 10lb-low cost Overnight Shipping. Royal Printing will not be responsible for the delay in delivery or re-schedule delivery due to weather conditions, shipping company delays, loss or damage of the order while the order is with the shipping carrier. Shipment and delivery dates are calculated based upon estimates provided by our suppliers. We will always act to make sure that delivery schedules are met. However, unexpected equipment failure, malfunction and or technical problems may delay the printing process. In case of delay caused by technical difficulty, rush charges/fees will be refunded or waived where applicable. It does not mean technical difficulty will not be the grounds for order cancellation or a refund. An unexpected weather condition which may impede on our ability to process and ship your order; like flooding, earthquakes, tornados, hurricanes, rapid climate shift, fire, lightning strikes etc. Royalprinting can only use its own shipping account and will not use customer provided account numbers for any couriers. Orders must be shipped at whole quantities and may not be split up. We offering Printing and designing services; our High-quality full-color offset and digital printing are available on multiple paper stocks and in various sizes. Our full service bindery department is always ready for Scoring and Folding. 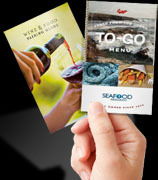 4 Panel Brochure is convenient to carry at anywhere; having the size 4" x 10". 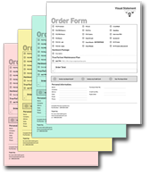 Royal Printing is your one stop for NCR -Carbonless forms. We offer Printing on EXCEL-ONE Paper with standard size 2-part, 3-part, 4-part, 5-part and 6-part with Black / Color. We Produce Classic Quality on 14pt., 16pt., 24pt, 38pt. We offer FREE UV Lamination Coating and SHIPPING. Artwork with low cost $25; future editing is FREE. FREE Artwork, Printing on Glossy #200lb card stock with UV Lamination finish. Our price range from each #1000 - $1.00, #500 - $1.78 and #250 - $1.88". Bulk Order discount for Booklet Stickers,Business Card Stickers, Mail Label Stickers, Product Label Stickers, Bumper Stickers, Name Tag Stickers and much more !!. Our standard size is Rectangle shaped and available sizes are 1 x 3, 1.5 x 3, 2x3.5, 2x4, 2x5, 2x6, 2x8, 3x4, 3x6, 3x9, 3.5x3.5, 4.5x4.5, 5x8, 5.5x5.5, 6x9, 8.5x11. We are offering high-quality full-color stickers printed on 60 lb. 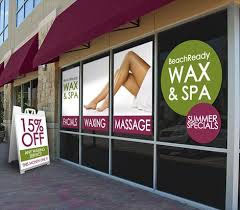 Gloss Coated Crack and Peel with FREE High Gloss UV lamination finish. Our minimum quantity orders are starting from #250. Please contact us for custom ordering sizes! Cost-effective way of labels can be used for Bottles, Glasses, Boxes, Bags, Bins, Logos, Books Packing and much more. We are offering various sizes & shapes with multiple type of materials. Our normal offering shapes are “Circle, Starburst, Oval, Rounded Square and Rounded Rectangle”. 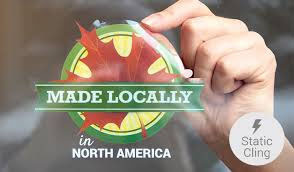 Our High-quality full-color Labels are printed on “Clear BOPP (Indoor), White BOPP (Indoor):- Can easy to write with Matte Finish, White Textured Estate #8 (Whine Label) , White Vinyl (Indoor & Outdoor)” finished with Clear Gloss Lamination or Matte Finish. Our minimum quantity orders are starting from #250. An nused space can use into an effective advertisement. This thick and low-tack adhesive can apply in any cleaned or flat surface and easy to reposition.